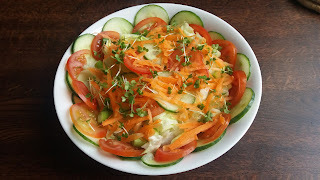 I love the modern way of serving salads where you toss everything together and add a dressing but there are times, especially when serving to older or more traditional people where such a bowl can almost inspire fear, so I always keep this one on standby. I provide a dressing too, but pour that over when it is on the plate so that it can be an optional extra. 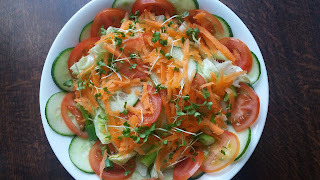 I would not usually serve iceberg lettuce in a fresh salad but here it fits the bill. Remove the outer leaves from the lettuce, then chop and slice, rinse and spin dry, and place in the bottom of a large salad bowl. Slice the cucumber thinly and line the outer edge of the bowl, placing the remainder in the middle. Slice the tomato and intersperse with the cucumber. Wash the spring onions, and chop. Spread around the ring. 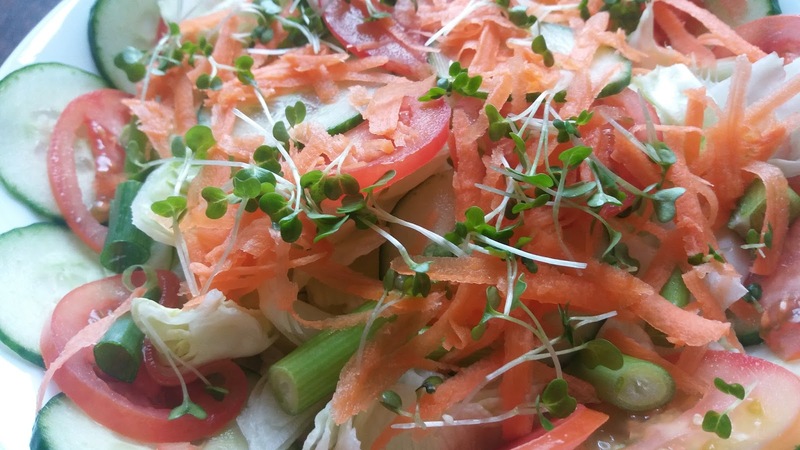 Wash the cress and sprinkle on top of the carrot. Serve with a dressing of your choice on the side.